The Puddinette, being wise and smart and, well, Just. Plain. Awesome, pointed out to me last night that I had unintentionally trod upon ground long ago surveyed by Dr. Seuss. The good doctor, by the way, is a personal hero of mine. And I don’t mean like, it’d be kinda cool if he gave me a stinky, bloody, grass-stained, game-worn football jersey in exchange for a bottle of Coca-Cola. I mean that he sits so high upon a pedestal in my mind that the ancient Babylonians, when attempting to build their tower, didn’t spec it tall enough to reach up there. Is that laying it on a bit thick? Hey, look, everybody’s got role models. Mine just happens to have had a wonderful imagination and made up nonsense words. I say that’s better than being held in great esteem for the ability to score points or make music while abusing either women or controlled substances. Ahem. What I mean to say, there, is that if you ask me, it’s pretty cool I happened to lay down the same basic idea he did, independently and years later. If only I’d written it so well. Speaking of wishing things were written a bit better, I watched The Twilight Saga: Breaking Dawn, Part I last night, which is nearly as big a mouthful as the Los Angeles Angels of Anaheim. Sadly, I’m betting the baseball team is more exciting. And we all know that baseball can be the dullest sport on Earth sometimes, with the possible exception of televised bowling, right? Why did I subject myself to that on a Thursday night, you ask? Well, I’d had a good day so I was in the mood for a beer or two and a movie, and hey, look, there it was, ready on my DirecTV Cinema playlist. It was either that or something certifiably terrible like A Very Harold And Kumar Christmas. I don’t, um, smoke, and Christmas is, well, over, so that wasn’t hitting me in the sweet, tickly spot, if you know what I mean. Of course, glittery, uh, vampires, don’t usually either, but if you’ll recall, I do have a personal responsibility to watch the entire “saga”. Also, I figured if I fell asleep, as I’m wont to do, I could just pretend I saw the whole thing and call it day. Surprisingly, I did manage to stay awake the whole time. But not because the movie was really all that compelling. I mean, I suppose watching a recently married and newly knocked-up 18 year-old waste away as her progeny devours her life is possibly entertaining to some, but I figure those people already have 16 and Pregnant DVR’d. No reason to make an entire movie about it. The film needed an Andre the Giant-sized dollop of additional conflict. Sure, there’s some weak effort at in the whole Jacob vs his pack thing and, of course, the glittery set against the overgrown growlers, but neither was really set up to any degree. It seemed like those adversarial positions were just suddenly there, and the viewer was expected to go along for the ride. Which kind of lost me, because didn’t the wolves and the shiny, sparkly Cullen people play nice against the mean vampires just one movie ago? The thing is, I get what they were going for, but the whole thing felt too much like it was made with the book readers predominantly in mind. Guess what? I haven’t read the books. So, yes, I felt some underlying tugs of what was supposed to be going on, but it all seemed glossed-over at best. And as Part I of a theoretical two-part adventure, I would assume you’d lay some groundwork for the upcoming film when you could. You know, kind of prime the pump and get Suzy Moviegoer all a-twitter for the next one? In other words, at the end of the this one, I totally should have been, “Oh, dude, I’m all tingly in my cockle parts and can’t wait to see the next one to find out what happens with blabbity-blah-blah”. At this point, though, if something else is supposed to happen to blabbity-blah-blah, I don’t really care. The series could be over as far as I’m concerned. Which seems an odd way to end a “Part I”. The Twilight Saga: Breaking Dawn, Part I wasn’t awful, but it could have been better. Hopefully Part II will deliver more compelling plot points and conflict. Now then, fangirls and boys, flame away. My comments are at your disposal. 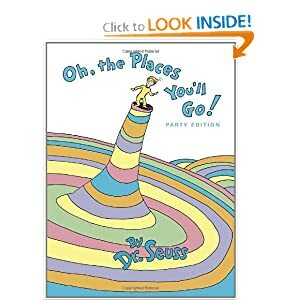 First of all…I love and admire “Oh the Places You’ll Go”. When a good friend took a big leap and moved to California after his senior year of high school I gave him this book and a nice collage of some fun memories…needless to say it’s been 6 years and he still has it sitting on his desk. Second of all..your review on Breaking Dawn pt. 1 and our sparkly vampire friends…is well…spot on! I wish Robert Pattinson didn’t waste his time and good looks with the movies and I’m still ashamed that I wasted money to see the first one. “Oh, the Places You’ll Go” really is the best. I can’t wait to give all my kids a version of it when they head off to college (many years from now). Sounds like you made a really nice gift with it.